I’m a big believer that the smallest changes can make the biggest difference. From purchasing a freshly cut bouquet to gaze at while working, to adding some limes and raspberries to your water for that extra hint of flavor, to burning a favorite luxury candle during your morning routine, it’s the little things that transform our daily lives from the dreary to the extraordinary. In creating The Estate Collection line of luxury candles, I’ve sought to integrate my experiences as a world traveler, design enthusiast, and collector of beautiful memories into some truly enriching fragrances. Along the way, I’ve also learned the utterly fabulous and uplifting impact that essential oils and their aromas can have on our everyday lives. Now that I’ve unlocked this secret, I never want to go without gorgeous and inspirational scents. That’s where my new line of KIMONO Fragrance Oil comes in, which officially launches today. I’m so excited to share this fabulous new fragrance oil with all my loyal followers! As much as I adore my luxury candles, I often find myself missing my home fragrance collection whenever I’m commuting, traveling, or out on the town. After all, why wouldn’t I want the same uplift that I get in my home and office when I’m on the go? I want to feel my best no matter where I am or what I’m doing! With the KIMONO FRAGRANCE COLLECTION, we can all feel refreshed, stimulated, and extraordinary 24-7. Just a dab of this natural oil blend to the pulse points on your neck, wrists, and chest will instantly awaken and invigorate you. 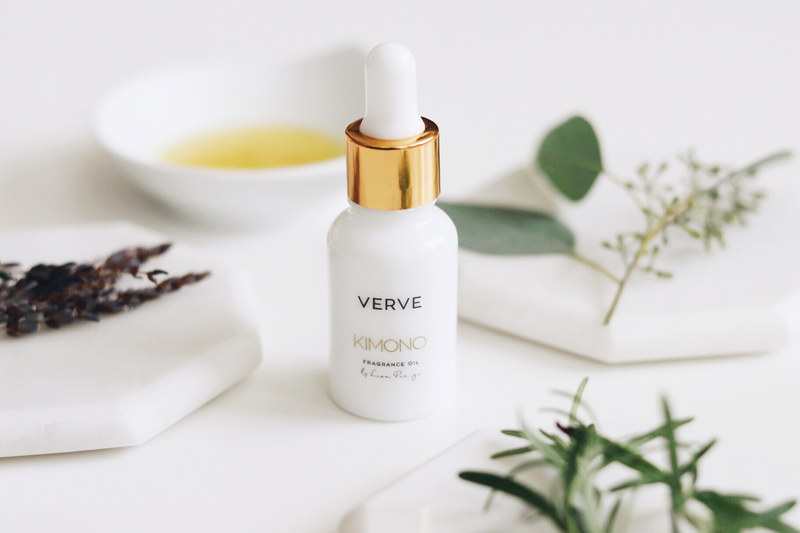 The word “kimono” literally means “a thing to wear,” and the KIMONO fragrance oil collection was thus designed to be worn daily like any other essential element in your wardrobe. 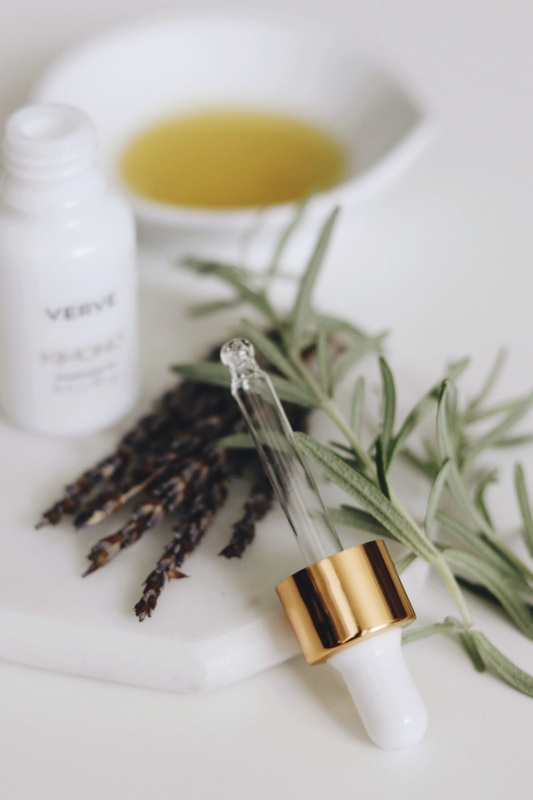 It’s a perfume oil that’s nourishing for your skin, and emotional well-being. 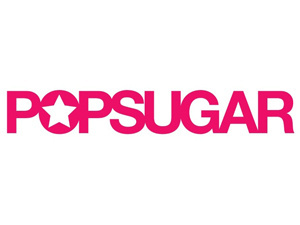 Best of all, we specifically formulated it to be alcohol and paraben free! While I love to think that they’re called “essential” oils because they’re so necessary to my overall well-being, the term actually refers to the heart or essence of a plant. The extremely beneficial and aromatic quality of these oils that are naturally derived from flowers has made them popular in medicine, cleaning, and beauty alike. What I love most about my new fragrance oil is that it was developed to draw upon the power of aromatherapy—the practice of using scents to naturally cure ailments and support emotional health. The first fragrance in my KIMONO collection, VERVE’s natural aromatherapy blend allows you to both feel and smell terrific from dawn to dusk! 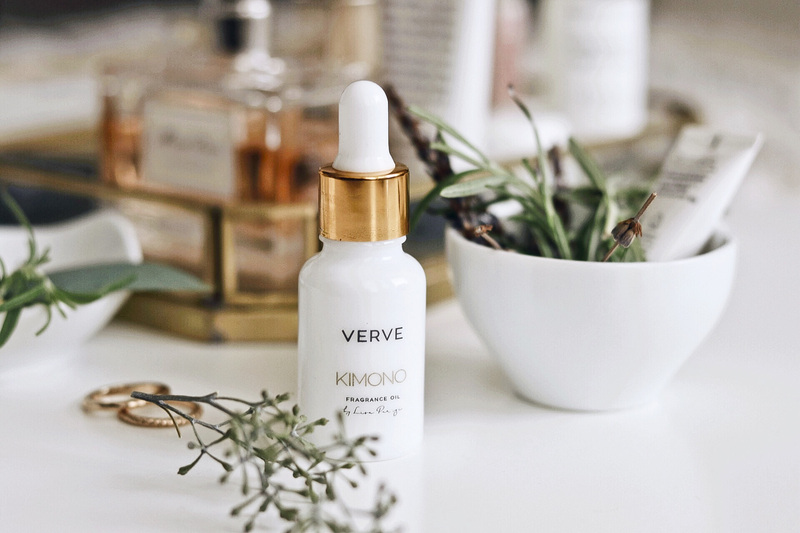 With all-natural ingredients that you can both pronounce and depend on for a delicious and alluring scent, VERVE is the first fragrance in my KIMONO COLLECTION lineup. 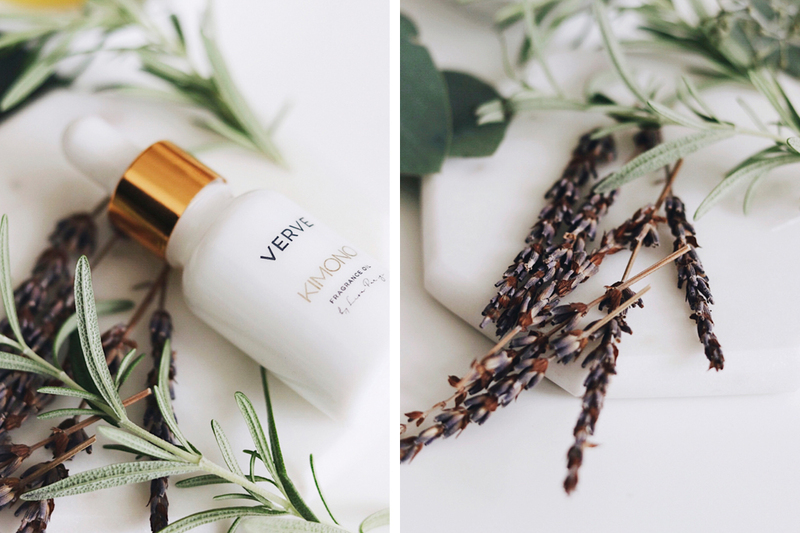 Combining hints of safflower oil, lavender, bergamot, rosemary, eucalyptus, and other essential oils, VERVE is like a wonderful yoga session, power nap, and stroll through the park all combined into a single delightful bottle. Like the cheer and beauty brought to the wearer of the traditional Japanese garment, VERVE KIMONO brings joy to the user and her lucky neighbors alike. This scent embodies the vigor and vivacity that define the word “VERVE”, which allude to the fragrance oil’s uplifting aromatherapy benefits. The sweet scent of Bergamot is a stimulant that improves blood circulation and hormonal balance, evoking feelings of joy. Eucalyptus’s refreshing, clean aroma has wonderful anti-inflammatory effects and helps open up airways and clear congestion. 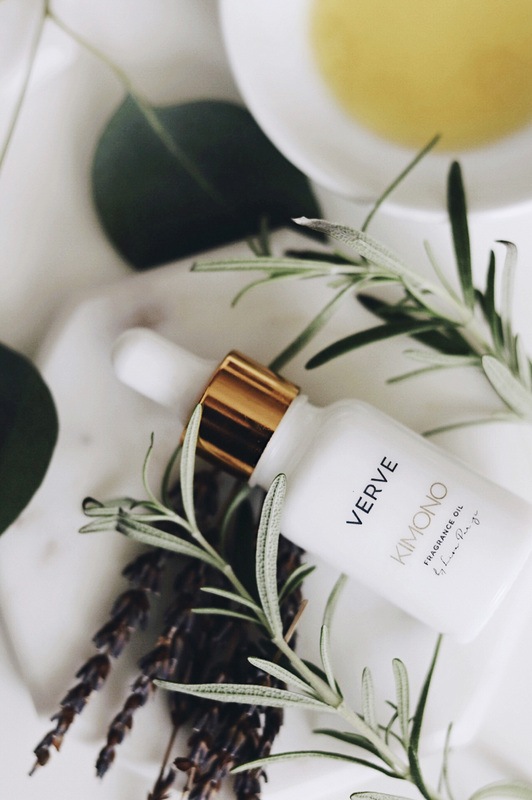 The delicate blend of these and other natural oils in the VERVE KIMONO fragrance cultivates an inspired, clear-minded mood, ensuring that you’re ready to take on the day! I’m so honored to share this breathtaking new product with you! It’s thanks to your support that I have developed the KIMONO FRAGRANCE COLLECTION to contribute to creating a more beautiful, blissful daily experience. I can’t wait to hear your thoughts!